Japanese anime is a big hit all over the world. Lately, a new one has been climbing the rankings. Have you heard of Pop Team Epic? 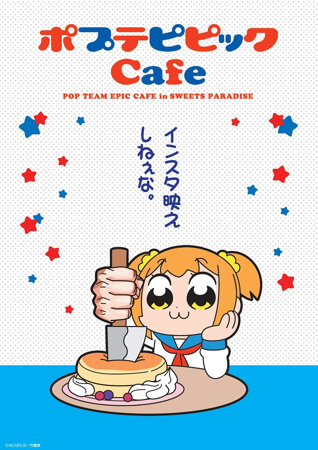 Pop Team Epic (Poptepipic) is a digital manga series that uses punchy images and snappy phrases. It has become increasingly popular as a surreal visual gag manga. Now, it’s not only turning into a big hit in Japan, but all over the world! 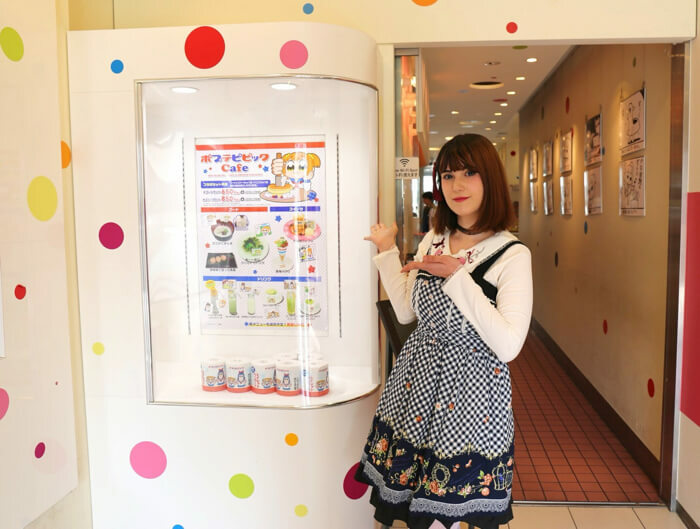 We heard that Harajuku’s dessert café Sweets Paradise is opening a collaboration café with Pop Team Epic, and as big anime fans ourselves, we immediately set off with MOSHI MOSHI BOX staff member Ruki to check it out. To get there, exit Harajuku station (JR Yamanote line) from Takeshita exit and walk straight. On your left, you will notice the shopping centre SoLaDo Takeshita Street (SoLaDo竹下通り) . You will find “Sweets Paradise on the 3rd floor. 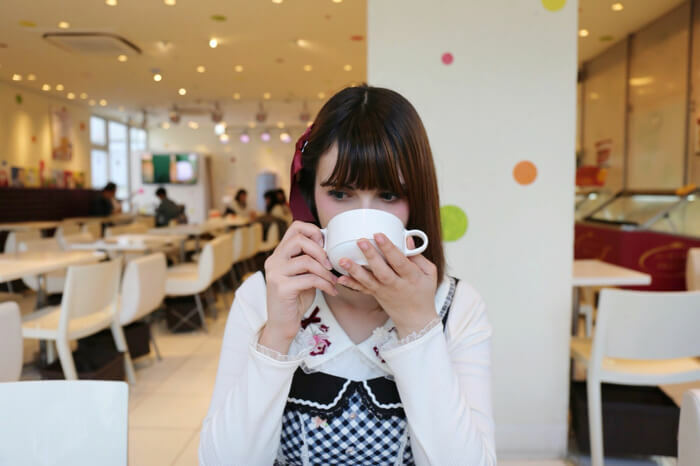 To eat at Sweets Paradise, first you need to purchase a ticket from the machine at the entrance and then enter the café. 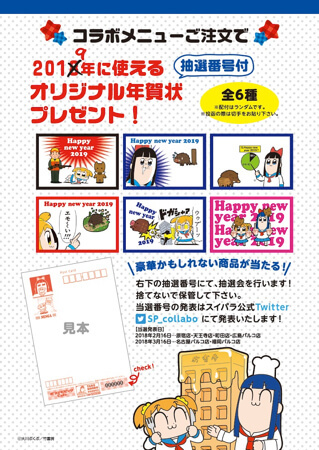 You can also add foods and drinks from the Pop Team Epic collaboration menu to your chosen meal plan for ￥500. To do this, buy the appropriate ticket from the machine at the entrance. 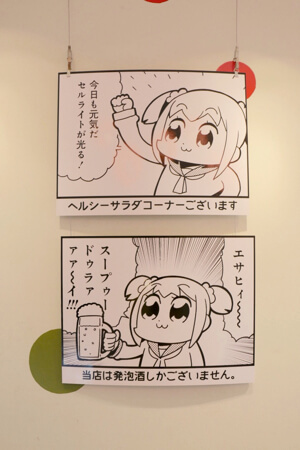 There are Pop Team Epic decorations all around the café! 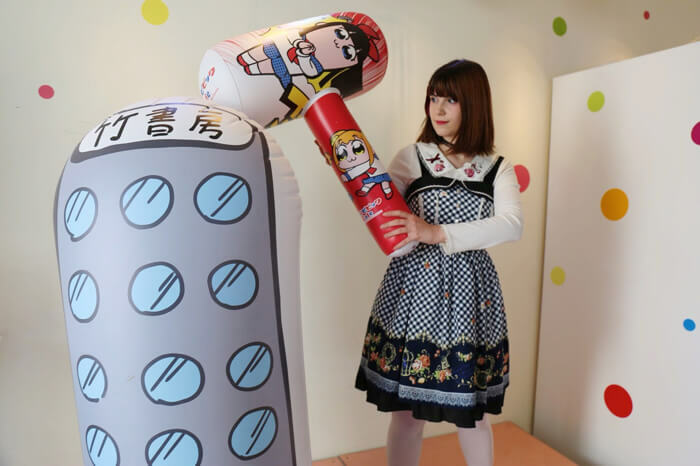 There is even a small set where you can destroy the Takeshobo publishing office, which comes up in the manga! 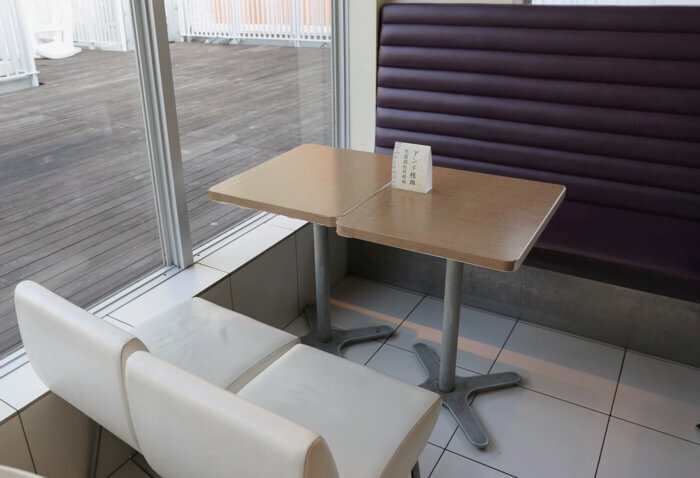 There are two types of seats inside the café: “anti-sama/ Takeshobo company employee seats” and the “believers’ seats” . The “anti-sama” tables are decorated very simply. 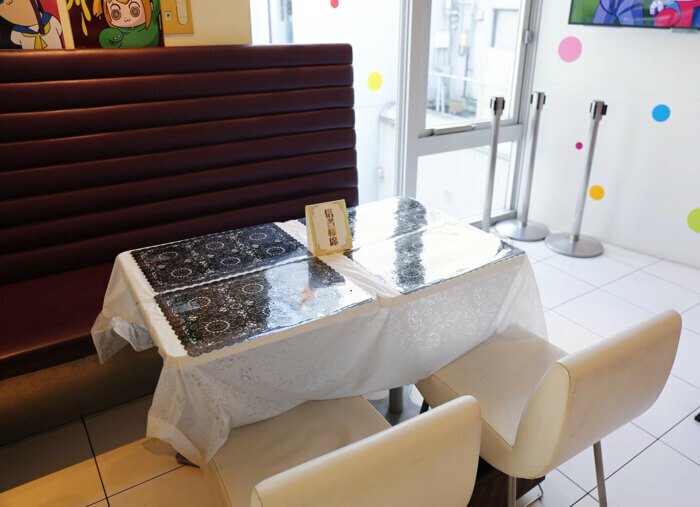 In contrast, the “believers’” tables are draped with beautiful table cloths and are near a large screen that is showing episodes from the Pop Team Epic anime. Being slightly peckish, Ruki did not waste time in scooping up the menu. This dish is called “Aaaaah ichimen no Kusomidori Pasta” （Aaahh a plate of gross green pasta）. 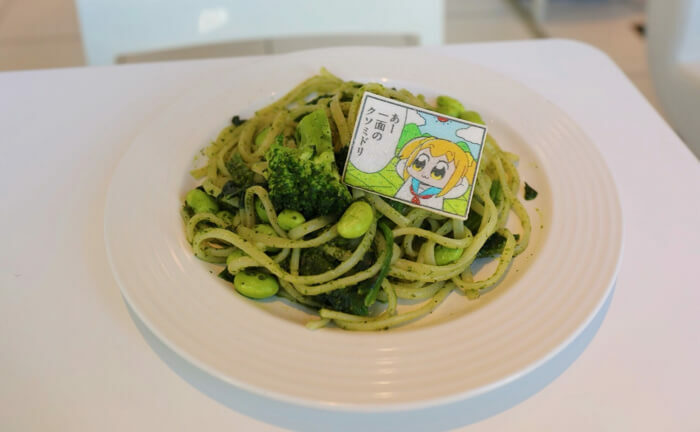 The random words of countryside-raised Pop Team Epic character Popuko, has been made into a pasta dish. Ruki: “Spinach, edamame and broccoli – this truly is a green dish! The basil sauce is very simple yet delicious! Is this the true taste of nature?! 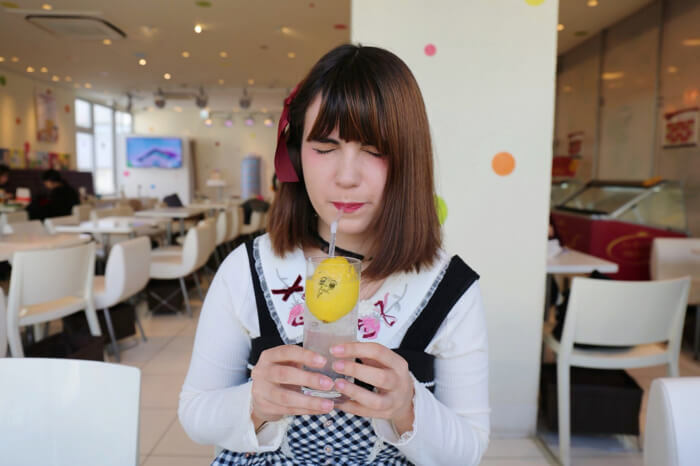 This is the “Konna kao ni naru lemon Juice” (Lemon juice that makes you pull this face). 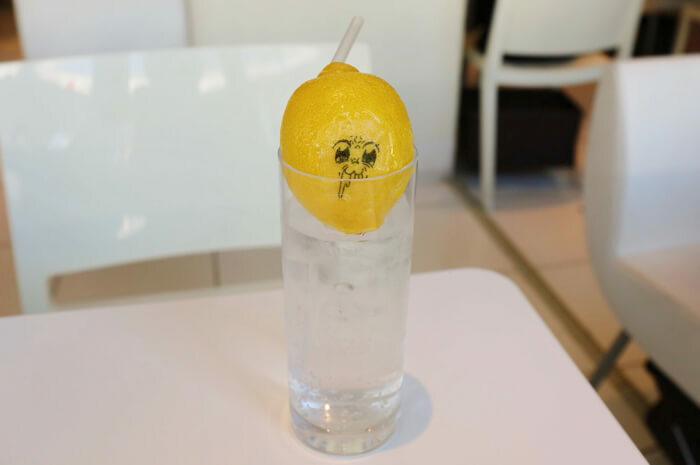 Although a bold move, half the lemon is cut and placed as it is in the glass. Whatever the menu, the names of the foods are crazy! Just what you would expect from Pop Team Epic. Riku’s reaction to the sour drink was predicted by the name of the drink! 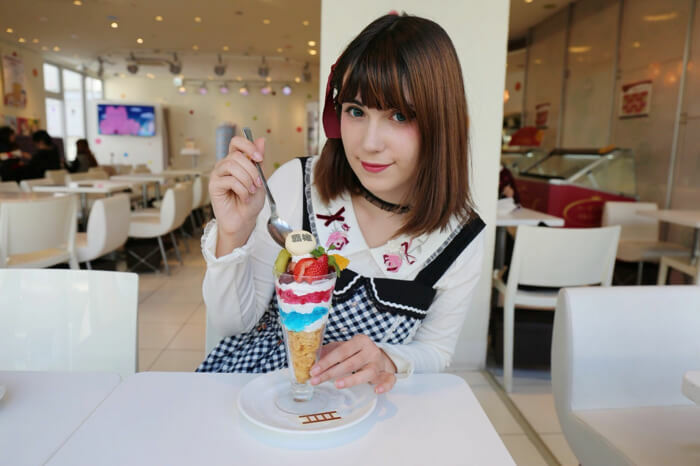 This is the “Haken Parfait” (Hegemony parfait) You can even order one that is the size of Ruki’s head! This is one filling dessert! The word “覇権” (hegemony) is written on a macaron that sits on top of a pile of fruits and strawberry sherbet. At the foot of the parfait lies a wafer with a picture of a ladder on it. 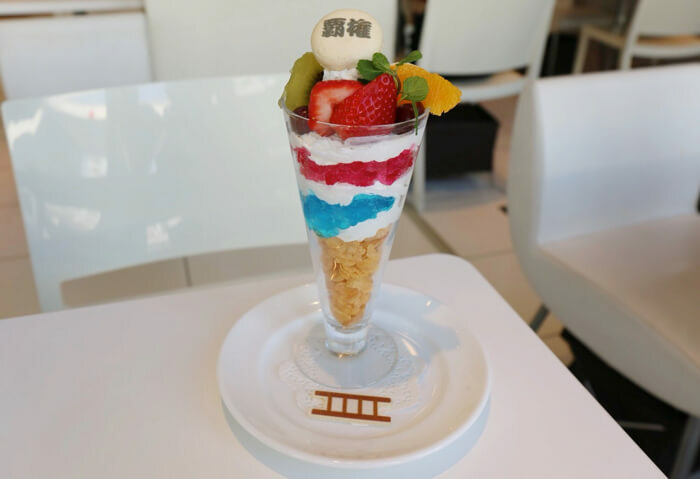 The parfait is an original art piece that depicts a ladder which leads to the top of the parfait to have been toppled over. After looking up the word “覇権” and realizing its meaning, Ruki laughed a lot. The last item Ruki ordered arrived. The Imi ga wakarimasu ka? Café latte. (Do you know what this means? Café latte) As you can imagine, it was quite difficult to say this name to the waiters and waitresses when ordering. There’s a pie chart drawn on the latte, but 90% of it is filled in with the answer “no”. Ruki: It goes well with the desserts because it isn’t sweet! 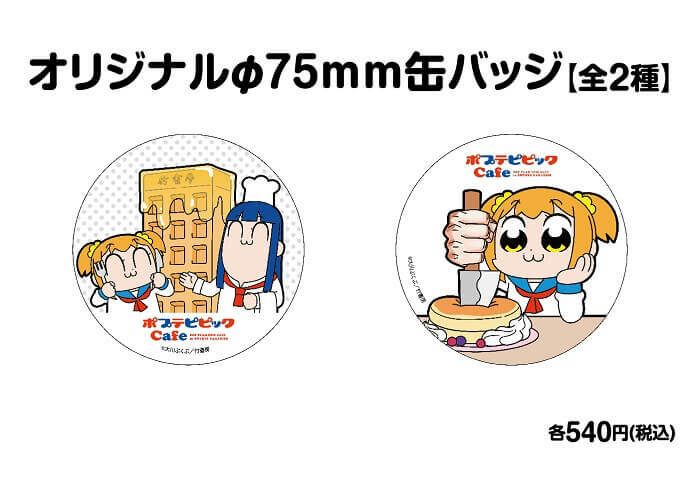 Pop Team Epic goods are also selling at the cash register! The variety of goods stretched from stickers, keyrings and manga to toilet paper with scenes from the manga printed on it! The café is only open until 13th March. Opening times vary depending on the café, so make sure you check the opening times before turning up. 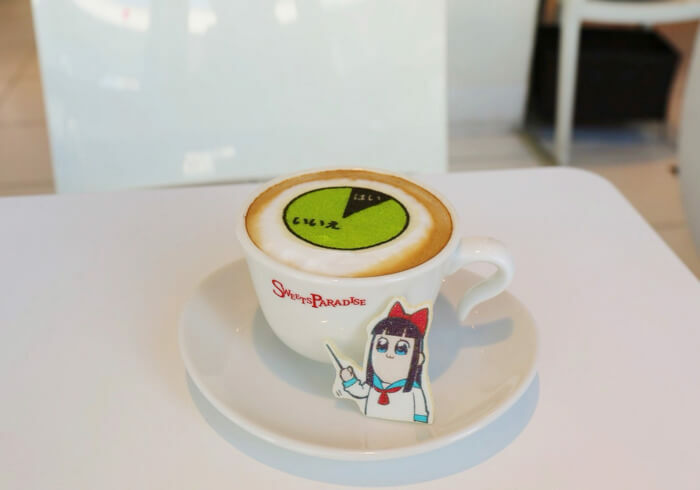 Don’t miss out on your chance to eat at the Pop Team Epic collaboration café because the manga is becoming more and more popular!